I decided that although it’s not my usual style, I just had to make the dress, so once the pattern pieces were traced, I started cutting the fabric that I had bought especially for this pattern (typically, I didn’t have anything suitable in my stash) which meant I just had to buy some of this gorgeous Liberty Tana Lawn, from Abakhan. I was just going to get a relatively cheap cotton, but when I realised that a small selection of Liberty prints were available at just £5 per meter, I decided I had to give this legendary fabric a try. Let me be honest here, I’m not part of the Liberty Print fan club – I like solids; I don’t really do florals, or abstracts etc, in fact the closest I come to a pattern is stripes…but this fabric is a stripy print – perfect 🙂 The fabric itself is beautiful to handle, presses like a dream, doesn’t fray and is nice and stable, really lovely stuff to work with. 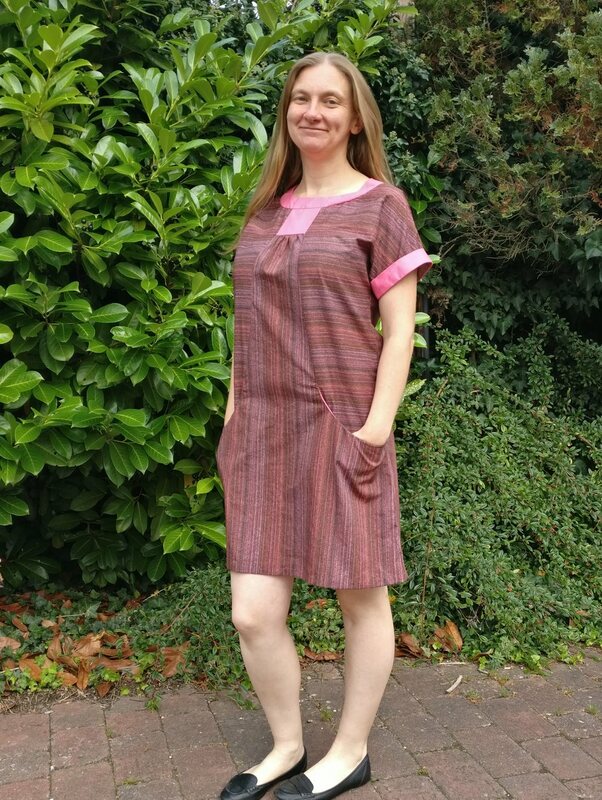 I also decided to use some of my walkaway dress pieces as the contrast cuff, neckline, pocket facings and yoke pieces – I think the pink works well with the fabric, making it appear less brown. I found two pink heart buttons that match the pink fabric well and I love the little detail at the back. 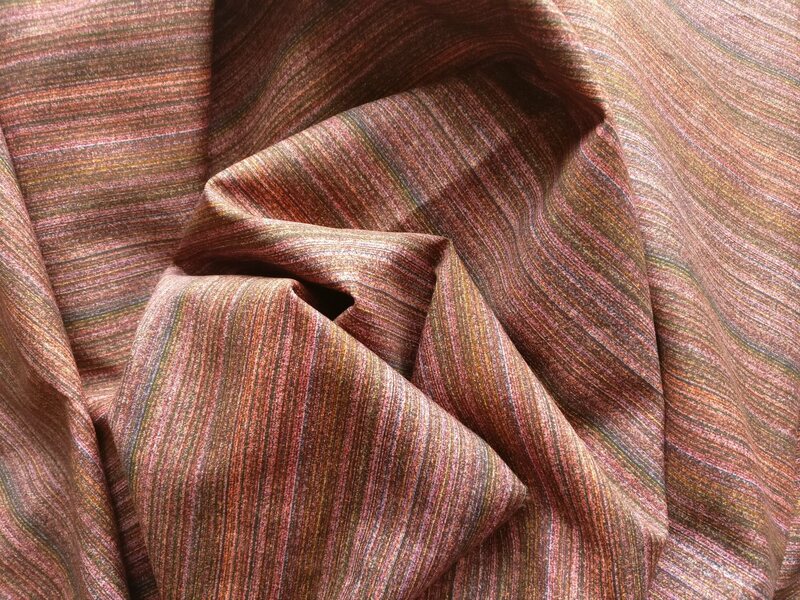 It dawned on me that as I had bought stripy material I had the opportunity to do something I don’t normally get the chance to do. 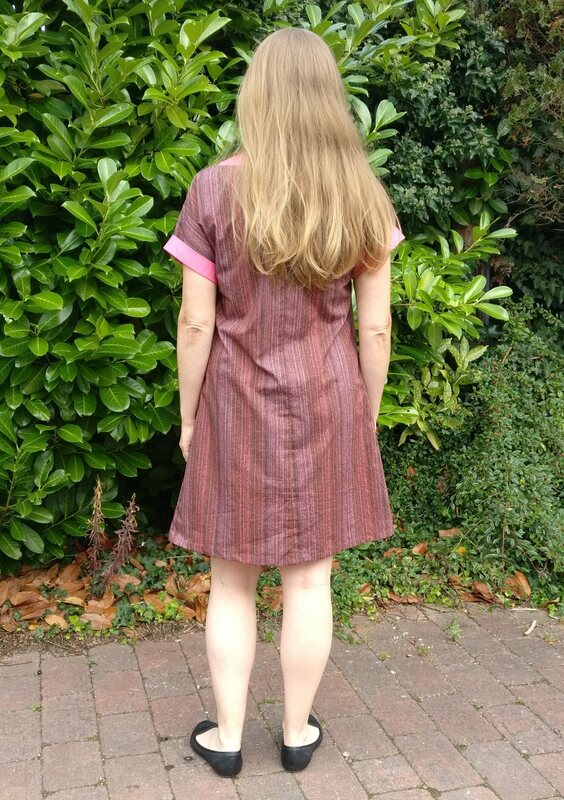 I wanted to bring out the style lines of the front, so decided to cut the side panels on the cross grain – I hadn’t realised when I planned this that it would have the added advantage that I wouldn’t have to stripe match apart from in theory at the centre back seam, – but in this random stripe I didn’t think it mattered much. In fact the only stripe matching that I wanted was to get the horizontal lines across the sides to match pretty closely – as they aren’t actually touching, I didn’t think it would matter if they were a couple of mm out, but I think I’ve done quite well, thanks to the good quality printing and stable nature of the fabric. Construction of this dress, although different to the dresses I have already made, was fairly straightforward. Placing the side front pieces on to the centre front and pocket facings confused me, and the only way I could work this out was to arrange the pattern pieces so that the front looked finished, and then determine where I needed to sew. I very nearly sewed them on backwards, but I avoided that. 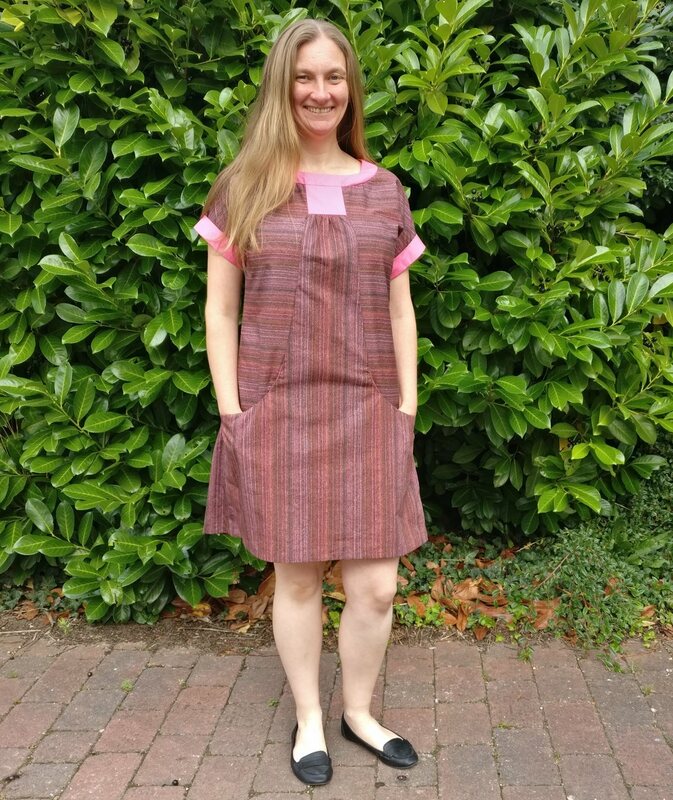 I also had an issue with the neckband pieces; I realised that I needed to match the seamlines, rather than the cut edge, and with lots of pinning everything came together well. Simplicity 2245 Neckband; Lots of Pins! The dress came together remarkably well, and much quicker than I anticipated – especially as we had to deal with a minor flood in the house over a couple of days. 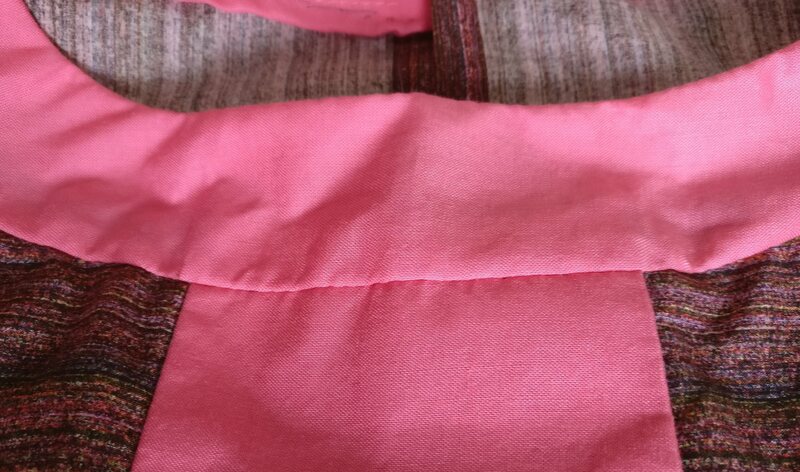 It took me rather longer than it would otherwise have done as I decided to do some hand stitching – on the hem and also edge stitching the neck facing. All in all, this pattern is a good beginners pattern for making a dress that’s not the usual three-panel shift dress. 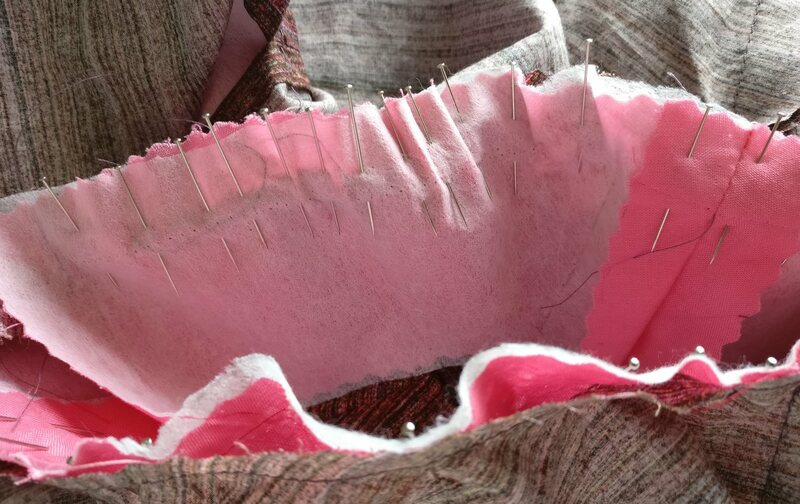 Invisible edge stitching around the neck facing – NB, I used purple thread here as it was the least visible colour on the liberty fabric – any visible stitching shows up like a sore thumb on the pink! This style of dress is definitely not my usual style (let’s be honest, my preferred style is jeans and t-shirt!) if you do find me in a dress it’s always fitted, and made of a knit whenever I can. I am, however, surprised how much I enjoy wearing this dress. I don’t think it particularly flatters my shape, but it is just so comfy. Nope, really it is so comfortable! Incidentally, I don’t normally wear dresses with pockets, but I think it may be notable that in every photo where I didn’t have my hands in the pockets I was looking decidedly grumpy! As I mentioned, this out of print pattern is not mine, but is making its way around the world to be made up by those people lucky enough to win a month with the pattern. 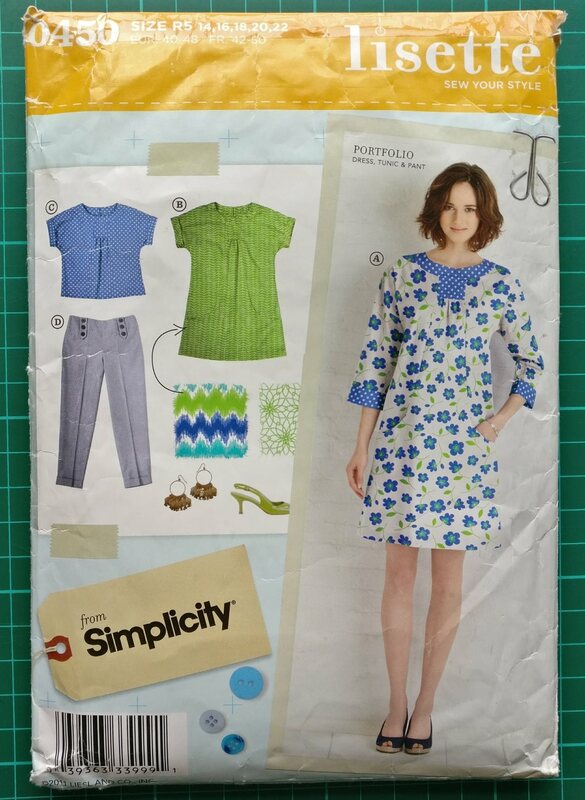 Full details of the pattern relay are available on WrongDoll’s blog, but essentially should you win, you must not cut the pattern, and you have one month from receipt of the pattern to make up one of the pattern views, post images on Instagram and then send the pattern on to another sewist somewhere in the world. If you want the chance to get a copy of this pattern then please follow me on Instagram (@sewsmartuk) and leave a comment on the giveaway post before 27 August 2017. NB, compared to most people on Instagram I have very few followers, so you have a much better chance than normal of winning if you’re interested!